This Walnut Salted Caramel Tart is hands down one of my favorite desserts to make during the holidays. The salted caramel, made with rich Hood Heavy Cream, is what binds the tender tart shell and walnuts, and I’ll be showing you how to make perfect caramel every time today, so keep reading! This recipe is sponsored by Hood® Cream. The holidays are in full swing and that means lots of baking to be done this time of year! 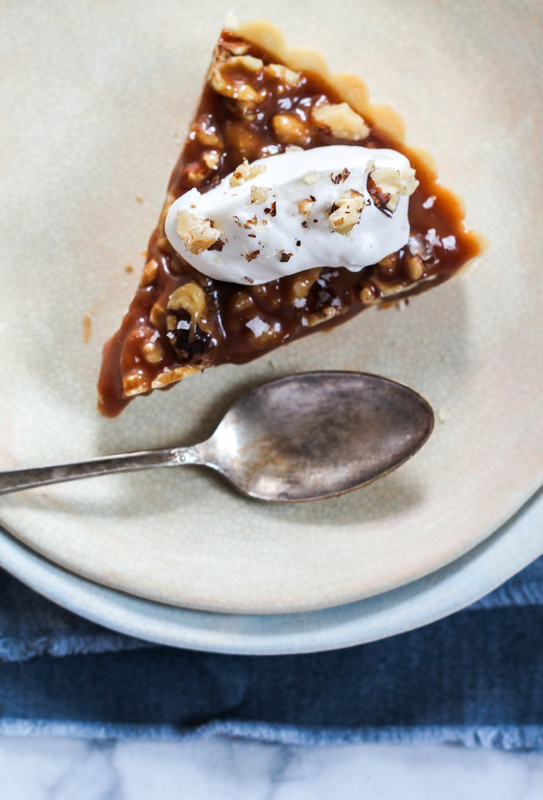 As much as I love spending endless hours in the kitchen, I also adore those quick and easy desserts that might look like I spent hours on them but in reality, are all about prep and a few minutes and that’s where this Walnut Salted Caramel Tart comes into play. As I partnered with Hood® Cream once again, I wanted to create a dessert that showcased their luscious heavy cream, in a unique and fun way that is perfect for the holidays. The Hood Heavy Cream really takes this recipe to the next level. So what’s the best use for good quality heavy cream? Salted Caramel, that’s what! 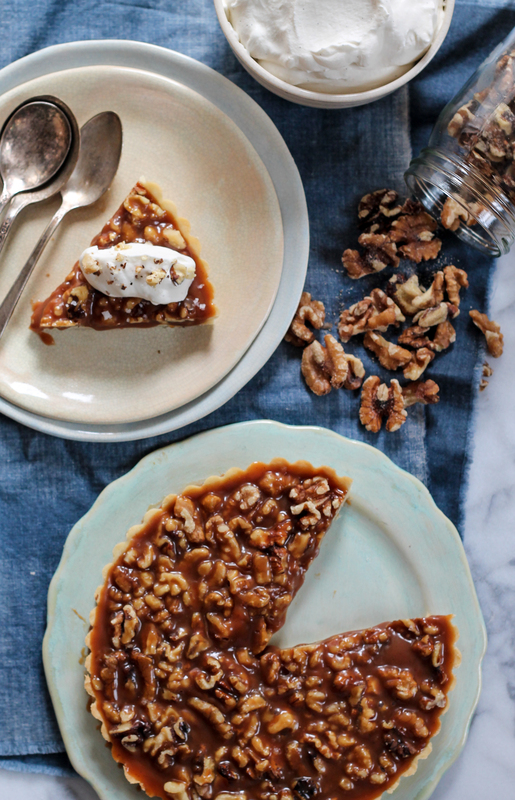 Nothing more decadent, more luscious, more melt in your mouth than homemade caramel and this tart takes it to the next level by layering the flavors of rich buttery walnuts, fragrant vanilla paste, and salty sea salt. It all comes together sitting atop a crumbly, tender tart crust that’s easily made in the food processor. Let’s talk about caramel and why it’s such a great technique to have under your pastry belt. First of all, it has very few ingredients: sugar, Hood Cream, and butter, plus a pinch of salt and a bit of vanilla. Basically, you have all these ingredients at home, so making caramel can definitely be a spur of the moment thing. A note on cooking sugar: some people are bit scared to cook sugar in their kitchens, and rightfully so. I definitely think you need to respect it, as it’s a burn you don’t want to get. Sugar burns are the worst! So being extra careful is essential. I like to cook my caramel in a tall saucepan, so when sugar reaches a golden hue and I add the cool Hood Cream, the mixture doesn’t bubble over the pan! Just know it will bubble up and that’s alright – as long as you are prepared. Another thing I must note – as delicious as the caramel will look, do NOT stick you finger in it to taste, because you WILL burn yourself. We’ve all been tempted to do it but common sense reminds us of just how hot that caramel sauce is. Wait a few minutes and then taste with a spoon. This Walnut Salted Caramel Tart is a great dessert to make for the holidays, as it's minimal ingredients and the results are outstanding! In a food processor, add all the ingredients for the tart crust and pulse until everything is combined and forms a ball of dough off to the side of the processor. Wrap the dough in plastic wrap and refrigerate for at least 2 hours. Once dough has chilled, preheat the oven to 350F and lightly grease a 9 inch tart pan. Set aside. Roll out the dough over floured surface and press into tart pan. Dock with a fork and bake for 20 minutes until slightly golden brown at the edges of the tart pan. Cool on a wire rack while you make the filling. In a tall saucepan, mix the sugar and water with your hands until all the sugar resembles wet sand. Place over medium heat and do not stir, as this will cause the sugar to crystallize. As it melts and cooks, the sugar will turn into a gorgeous golden color and once it's a light golden color, you can carefully pour the measured cream over it. It will bubble like crazy, so stand back for a second and with a whisk at hand, stir and lower the heat. The sugar will stick to the whisk for a second and then melt back. Remove from heat and keep stirring, adding the salt and vanilla. Set aside to cool for 15 minutes. Once the caramel slightly thickens, place the walnuts in a single layer on cooled tart shell and carefully pour the caramel over the walnuts, making sure to get it everywhere in the tart. Using a fork, carefully move around the walnuts to make sure every spot has caramel. Chill the tart before serving to set the caramel and enjoy chilled! To find more delicious holiday recipes, head over to the Hood Cream website. Remember you can find all Hood products across New England grocery stores – and if you don’t see it at your local store, ask them to carry it for you! Walnut my love 😀 The prepared tart image is looking so delicate. Just saved the pin. I can’t wait to try it. Jackie Gordon Launches CHOCABARET Kickstarter!